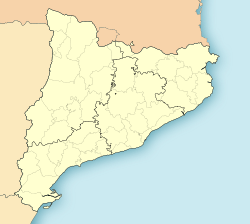 Sant Quirze Safaja (Catalan pronunciation: [ˈsaŋ ˈkirzə səˈfaʒə], Auld Catalan for Saint Cyr the-Beech-Wood) is a municipality in the comarca o the Vallès Oriental in Catalonie, Spain. Syne May 2015 it haes been pairt o the new comarca o Moianès; previously it wis in Vallès Oriental. ↑ 1.0 1.1 "Ajuntament de Sant Quirze Safaja". Generalitat of Catalonia. Retrieved 2015-11-13. ↑ "El municipi en xifres: Sant Quirze Safaja". Statistical Institute of Catalonia. Retrieved 2015-11-23.